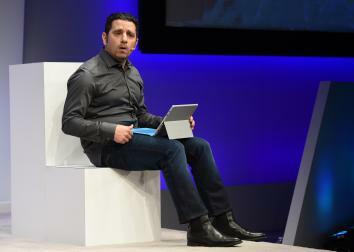 Microsoft Surface Pro 3 first look: Tablet or laptop? Tabtop or laplet? Could Microsoft’s New Tablet Replace Your Laptop? The Surface Pro 3 wants to be everything to everyone. Microsoft held an event in New York City on Tuesday, and the one thing people knew ahead of time was that the company was going to release a smaller version of its unpopular Surface RT tablet—a Surface mini. That one thing turned out to be wrong: There was no Surface mini on Tuesday, and there may or may not ever be one. Instead, the company released something more interesting. 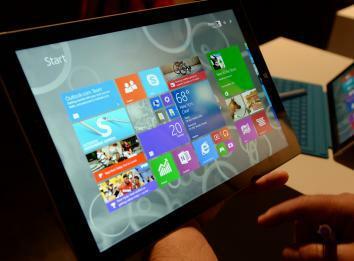 Pivoting from small to big, Microsoft unveiled the Surface Pro 3, its largest and most impressive tablet yet. With a 12-inch(!) screen and a price tag ranging from $799 to nearly $2,000 for the top-end version, it is not a tablet for the faint of purse. In fact, one could argue it’s not really a tablet at all. With its big screen, capable keyboard, flexible kickstand, and full-fledged Windows 8.1 operating system (good riddance, Windows RT? ), it’s more like a laptop in tablet’s clothing. 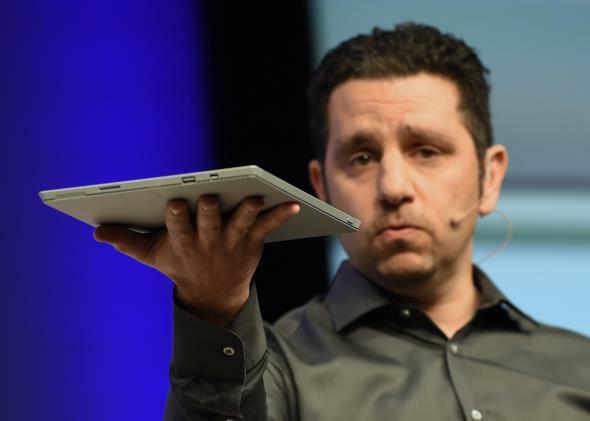 That’s exactly how Microsoft vice president Panos Panay pitched it on Tuesday. Noting that 96 percent of iPad owners also own a laptop, Panay presented the Surface Pro 3 as the first device capable of replacing both. Can you use it on your lap? Sort of! Whatever you call it, it’s an ambitious piece of hardware. I’m typing this blog post on its improved Type Cover keyboard right now, the tablet propped on my desk at a laptop-like angle. Taking advantage of the Surface’s multitasking capabilities, I have Microsoft Word open on three-fourths of my screen while my Twitter stream runs down the right-hand side. You can’t do that on an iPad (for now, at least). It also comes with a stylus, an accessory Steve Jobs famously eschewed. Convincing people that the Surface Pro 3 can do things an iPad can’t is the easy part, however. As I’ve noted before, people don’t buy iPads to multitask anyway—they buy them to escape from the burdens of multitasking. The hard part, then, is convincing people the Surface is a viable alternative to the Macbook Air, which costs only a few hundred bucks more. On specs alone, the Surface stands its ground. But for all the work Microsoft has put into making the device functional for work purposes, it still feels, on first attempt, like a poor substitute for a real laptop with a real keyboard. The weight distribution of a tablet simply does not lend itself to use on one’s lap, even with a nifty kickstand that allows you to prop it up at pretty much any angle you choose. The need to routinely switch between keyboard and touch controls does not help. The Intel Core-powered tablet is 0.36 inches thick, has a 12-inch screen, and weighs just under 2 pounds. And then, of course, there’s the albatross of Windows 8, an operating system that remains widely unloved more than a year and a half after its debut. It’s hard to know how much of this is my unfamiliarity and how much is Microsoft’s poor design, but this article took me significantly longer to write on the Surface than it would on either my Macbook or my old Windows XP desktop machine. That’s partly because Word crashed and had to restart for no apparent reason, and partly because simple tasks like copying a URL from Internet Explorer and pasting it as a hyperlink in Word took multiple rounds of trial and error. Fortunately for Microsoft, it may not have to convince individual consumers to spend their cash on the Surface Pro 3 rather than either a much cheaper netbook or a slightly pricier Macbook Air. Instead, it’s likely to focus on convincing businesses to buy Surfaces for their employees rather than other sorts of work laptops or tablets. That proposition might prove attractive for companies that have already invested in other Microsoft software, even if their workers aren’t thrilled with it. I’ll write more about the Surface Pro 3 once I’ve had more time to test it out. For now, I’m intrigued, but not persuaded. Would you consider dropping upwards of $799 (plus $129 for the Type Cover keyboard, which is a necessity) on a device that’s less fun than an iPad but less productive than a laptop? Or, to put it more charitably, more productive than an iPad but more portable than a laptop? Let me know in the comments. If Tablets Are Replacing Computers, Why Doesn’t the iPad Have a Keyboard?